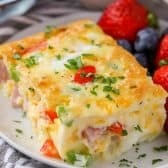 Tender onions, green peppers, ham, and cheddar cheese are folded into a fluffy eggs, making for the low carb breakfast you didn’t know you needed. Cook onion in butter over medium heat until softened. Cool. Whisk eggs and cream. Stir in remaining ingredients. Pour into a greased 9x9 casserole dish. Bake 30-35 minutes or until a knife inserted in the center comes out clean.